The phenomenon of open source software (OSS) is a recognized and mature aspect of the global IT market with profound implications for enterprise IT. A newer trend emerging is the various disciplines and methodologies that fall under the rubric of agile software development, which has a number of interesting parallels with and similarities to OSS. 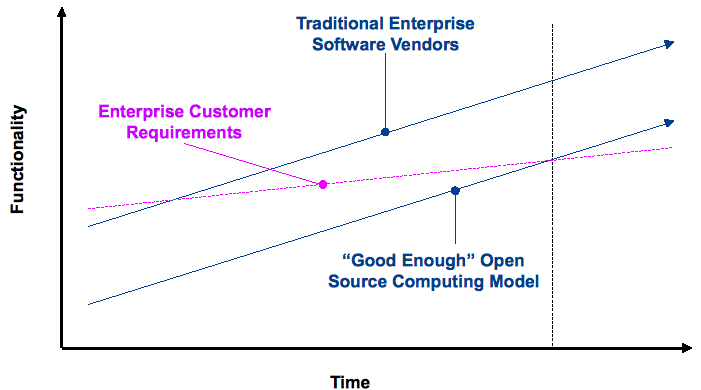 With the adoption en masse of OSS projects, such as Linux and Apache, by the mainstream enterprise customer, there is a track record of more than 10 years with which to gauge the extent and the nature of the impact on the enterprise. While agile has not yet reached the level of adoption that OSS enjoys, all indications are positive for that occurring in the near future. By examining its parallels with OSS, one can make inferences about the nature of the long-term potential impact of agile. I am honored to co-publish with Seb! Sebastian Hassinger has worked in the IT industry for more than 25 years in large firms and as an entrepreneur. He founded two ISPs, helped launched several startups, and held senior strategy and business development roles with Apple, IBM, and Oracle. Mr. Hassinger created the first customer support Web site for Apple Computer. At IBM, he helped create a new business unit in the Tivoli subsidiary to address the needs of system management in the Internet era; worked on special projects for Tivoli’s CTO, including defining an Internet protocol for management of dynamic services; and was Senior Strategist for IBM’s Pervasive Computing initiative. At Oracle, Mr. Hassinger is Director of Market Development, where his specific responsibilities include developing the financial services market worldwide and the Asia-Pacific horizontal market. He holds MBAs from Columbia University and London Business School, is a published author, and holds more than a dozen software and business model patents. He can be reached at shassinger@gmail.com). It looked at agile from a different point of view than typically done. See here for the full review of the presentation by Walter.